One of the most trusted names in the industry, Natuzzi Editions has built their reputation on quality craftsmanship and an extensive selection of leather upholsteries. All Natuzzi Twin Sleeper Sofas are built with solid wood frames, industrial strength webbing and a top-grain leather hide exterior. 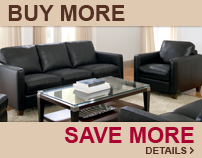 These Italian designed sleeper sofas provide the perfect balance of comfort and style. Natuzzi Twin Sofa Beds feature all of the qualities Natuzzi is known for. Tasteful transitional style and long lasting comfort combine to create a terrific seating experience. Natuzzi Sofa Beds offer terrific sleep solutions for any sophisticated decor. Many Natuzzi’ sleepers come equipped with a patented Greenplus Foam mattress. Greenplus Foam is an ecologically sound product, that offers terrific support, while molding to the contours of your specific body shape. Like all of our models, Natuzzi Editions Twin Sleepers are fully customizable. After selecting a product, enter the Design Center to choose from Natuzzi’s unbeatable selection of 100 percent top-grain leather upholsteries.